Bright pink hemp cord, 1mm, 205 feet spool for making macrame hemp jewelry, scrapbooking and crafts. 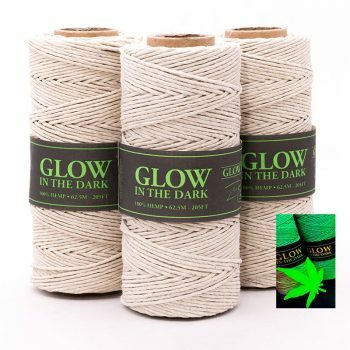 SIZE AND LENGTH: Hemp cord is measured in millimeters and feet based on standard industry sizes. However, the product you receive may be thicker, thinner, longer, or shorter, due to the sizes being approximate and are meant as a guide only. COLOR: Color shades vary between batches and no two batches are exactly the same. Different computer screens show different shades, so be aware the color you receive may not look exactly the same in real life. Photos are taken in natural light to show the true shade as best as possible, but without seeing it in person it is impossible to match colors exactly. WHY DOES IT VARY SO MUCH BETWEEN BATCHES? Because the cord is made in dye lots and due to the dye being chemical free and plant based (no chemical formula, all natural) no two batches will be the same. The only way to make something consistent in color, thickness and without flaws is to use industrial chemical based dyes and waxes. Hemp is not coated in any type of wax it is polished to remove flyaways with wheat starch. Tie knots, uneven coverage in dye, knotty bits may be found and are to be expected due to the natural manufacturing process. Flaws are not a fault of the product and are something we have no control over. WHY USE HEMP? Hemp fiber can be grown without the use of pesticides and is tested safe for babies and pets. After the dye process is finished the dye bath is so clean it can return to the rivers and streams. WHERE IS IT MADE? China, Romania and Hungary are the largest producers of hemp in the world, so it is safe to say hemp products will come from one of these three countries. HOW LONG DOES HEMP LAST? It depends on how you plan to use it, if it is not going to get wet it will last a long time. If you plan to leave it outside or wear it in the ocean it will not last more than a few months due to the fiber absorbing water. So hemp is best kept out of water? Yes, that is right, but to help it last longer you can coat it with with a light wax yourself, if you wish. WHAT SIZE BEAD WILL FIT? Hemp cord will not fit every bead for sale in our shop and it is up to the customer to determine the right size of hole. As a guide, if the hemp is 1mm you will need a bead hole that is 1mm or larger to fit. BULK / WHOLESALE? Yes. Discounts are offered for larger quantities for industry and events, just contact me with your request. For smaller lots of under 100 rolls, please visit our bulk deals section.